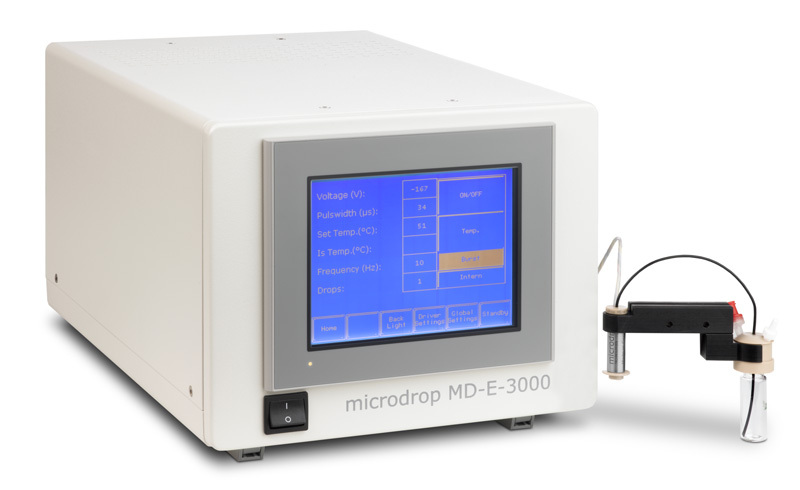 Microdrop dispenser heads function according to the same principle as an inkjet printer with a piezo-electrical print head. The liquid is fed through a capillary tube. To emit a droplet, a mechanical impulse is imparted to the liquid column by a piezo ceramic. At the nozzle tip a micro fine droplet is generated, which departs from the dispenser head at high speed. The size of the drop (15-120 μm) depends on the capillary opening and driving mode. Electronic control of the dispenser heads ensures a high level of dispensing precision as to volume, timing and placement. The procedure can be observed with the help of an integrated stroboscopic LED.